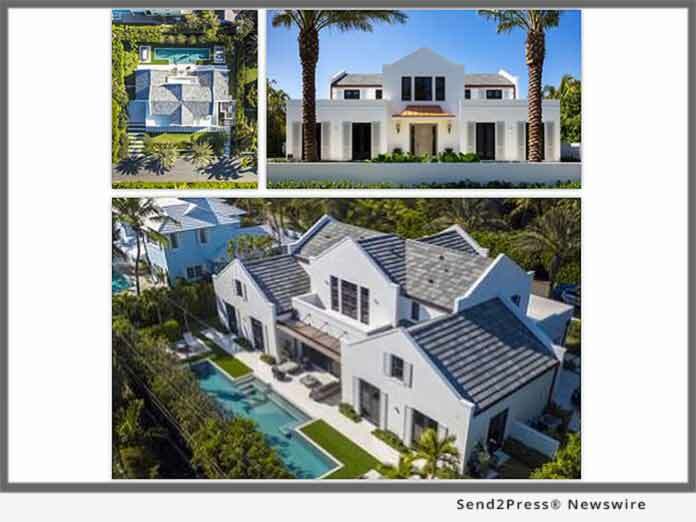 PALM BEACH, Fla., Nov 15, 2018 (SEND2PRESS NEWSWIRE) -- Jim McCann & Associates has announced an exceptional Palm Beach masterpiece estate offered for $7,595,000. This exquisite home and property offer an unparalleled combination of superior designer finishes exhibited within a striking architecturally designed flow and impeccable indoor/outdoor layout composition accompanied with gorgeous full-property landscaping. Boasting 5,187 sq. ft. of luxury living, this new home was carefully designed and meticulously engineered by the talented Lebarge & Menard Architects, masterfully built by Beacon Construction, and gracefully appointed by H-Interior Design. The 5-bedroom, 5.1-bath estate is skillfully crafted using the finest of finishes to detail all aspects of this one-of-a-kind Palm Beach estate. This superb residence boasts unmatched detail with no expense spared from the horizontal living room fireplace, to the vaulted ceilings and unifying herringbone pattern washed oak floors, to the impact windows, to the full house generator. This is a home for those who appreciate a harmonious blend of chic indoor elegance and casual outdoor living. Situated on a quiet north end street, a unique limestone driveway entry leads to the residence setting the tone for remarkable landscaping that is to follow with twin palms defining the property and artfully appointed shrubs, hedges, and mature trees creating idyllic privacy. Ideally located near the Sailfish Club, ocean beach access with a beach cabana and Lake Trail access awaits just steps from the home. Live year-round in desirable climate bliss soaking in the sun from the many outdoor living spaces to enjoy. From the unique main floor master bedroom pool access patio, to the gorgeous pergola covered outdoor lounge, to dining poolside, the spaces to appreciate this picturesque setting leave nothing to desire. Relax year-round in the 50-foot-long gas-heated infinity-edge lap pool while enjoying the classic Palm Beach lifestyle. The formal living room's sliding doors open to impressive views of the spectacular 50-foot pool so captivating that you will want to spend your days here relaxing in this sun-filled slice of heaven. Prepare your favorite meals in the beautiful European-style professional chef's dream kitchen complete with top of the line commercial appliances, hidden storage, and marble counters. This home is an entertainer's dream as each space was designed to flow seamlessly into the next. Appreciate the beautiful architecture as you take the curved staircase with lighted railings upstairs to the family room which serves as the base for this intelligently designed second floor. The bedrooms band around the communal family room making it the ideal layout for families or guests. All 3 second-floor bedrooms that make up this masterpiece custom home incorporate stunning features like vaulted ceilings, ensuite baths, and French door balcony access. 152 Dolphin Road is surrounded by the best of what Palm Beach has to offer from the close proximity to Michelin star dining, Worth Avenue world-class designer shopping, award-winning golf and tennis, the famed Society of the Four Arts Gardens, Flagler Museum and The Breakers, and Palm Beach International Airport. This wonderful home's location is ideal in every way. President-Elect of the Palm Beach Real Estate Board, Jim McCann, is not only ranked #40 in the Nation for 2017 but has been listed in the top 100 Real Estate Agents in the country since 2007 selling over $100 million in high-end Palm Beach sales each year. He is known for his unparalleled real estate marketing expertise, his masterful negotiating abilities, and for his excellent professionalism providing top customer service. Jim is constantly on the forefront of implementing cutting edge strategies to get his client's listings mass exposure. He continues to surpass the luxury real estate competition in Palm Beach year after year all while maintaining a reputation for doing business with the utmost integrity.